The p53 protein is a critical tumor suppressor and central mediator of cellular responses to stress. Inactivating mutations of the p53 gene occur in 50% of all sporadic human cancers. The mutation of p53 significantly correlates with genome-wide DNA instability and appears to represent a major genetic factor contributing to the extremely high levels of genomic instability found in high-grade osteosarcomas. We hypothesized that candidate prognostic biomarkers in osteosarcoma include elevated levels of expression of proliferation indices, such as Ki67, and amplification and overexpression of HER2 and p53 nuclear protein accumulation. Immunohistochemistry studies of osteosarcoma were planned to test the hypothesis. In this study, patients' profiles were treated anonymously and the study was ethically approved by the Hospital's Local Committee after consenting to the voluntary participation of patients. We used tissue specimens from 56 patients with mean ± SD age of 26.44 ± 12.51 years (range 14–68 years) with osteogenic sarcoma. All patients had undergone bone tumor resection with safe surgical margins. Primary treatment for patients with low-grade osteogenic sarcoma only includes wide excision. Chemotherapy, either prior to excision or postoperatively, is not typically recommended. Chemotherapy is warranted for all stages of high-grade osteogenic sarcomas. For metastatic osteosarcoma, 2–3 cycles of chemotherapy are typically given preoperatively; 3–4 cycles of chemotherapy are given postoperatively. Routinely, patients were observed for disease recurrence and death, at least once every 6 months, for about 5 years after surgery and yearly thereafter. For our patients, the mean ± SD follow-up period was 24 ± 3.75 months (range 18–52 months). We examined the coexpression of HER2, p53, and Ki67 in samples of bone tumor biopsy of those patients who were diagnosed for osteosarcoma at Kermanshah Medical University Hospital between 2009 and 2014, and then analyzed their significance for prognosis. One 4-µm section from each submitted paraffin block was first stained with hematoxylin and eosin in order to verify that an adequate number of malignant osteoblastic cells were present and that the quality of fixation was sufficient for immunohistochemical analysis. Serial sections (4-µm) were prepared from the selected blocks and float-mounted on adhesive-coated glass slides for HER2, p53, and Ki67 staining. Primary antibodies included rabbit antihuman c-erbB2 oncoprotein antibody (DAKO) at 1:200 dilution for HER2, monoclonal mouse antihuman p53 protein antibody (PAb1801; Novocastra, Newcastle, UK) at 1:50 dilution for p53, and monoclonal mouse antihuman Ki67 antibody (MIB-1; DAKO) at 1:100 dilution for Ki67. The DAKO Envision system (DAKO Envisionlabelled polymer, peroxidase) was used as the detection system for HER2 and Ki67. The streptavidin-biotinsystem (SAB-PO kit; Nichirei Co., Inc., Tokyo, Japan) was applied for the detection of the bound antibody of p53. Immunostained slides were scored after the entire slide had been evaluated by light microscopy. For all specimens, negative control was adjacent non tumor of specimen and positive control was on kit of stain. HER2 immunostaining was evaluated using the same method as was employed by the HercepTest (DAKO). To determine the score of HER2 expression the membrane staining pattern was estimated and scored on a scale of 0 to 3+. Tumors with scores of 2 or greater were considered to be positive for HER2 overexpression. The expression status of p53 and Ki67 was assessed according to the estimated proportion of the nuclear staining of tumor cells that were positively stained. Scoring criteria for p53 were as follows (in the form of the proportion of nuclear staining = score): None = 0, <1/10 = 1, 1/10–1/2 = 2, and >1/2 = 3. Scoring criteria for Ki67 were as follows (in the form of the proportion of nuclear staining = score): None = 0, <1/100 = 1, 1/100–1/10 = 2, 1/10–1/2 = 3, and >1/2 = 4. Tumors with a score of 1 or greater for p53 were considered to be positive for p53 protein accumulation, and tumors with a score of 2 or greater for Ki67 were considered to be positive for Ki67 expression. Collected data were documented using the Statistical Package for the Social Sciences version 20.0 (IBM Corp., Armonk, NY, USA). Statistical analysis was done using descriptive statistics. Results were expressed as percentages, frequencies, and mean ± S.D. The Mann–Whitney U test, χ2 test, Pearson Chi-square test, or Spearman Rho test were performed for comparative statistical evaluations among groups and for correlation analysis with histological and clinical parameters (tumor size, tumor grade, lymph node involvement, metastasis rate, coexistence of HER2 overexpression, p53 protein accumulation, Ki67 expression, and postoperative survival). Survival periods were counted in months from the date of the first visit to date of death or last follow-up before study closure. We used Kaplan–Meier method to estimate the overall survival for low and high levels of HER2 overexpression, p53 protein accumulation, and Ki67 expression. A P value of <0.05 was considered as statistically significant. A total of 56 confirmed cases for osteosarcoma were admitted during the period of January 2009 to December 2014. The mean age of the study group was 26.94 ± 12.51 years with 39 males (70%) and 17 females (30%). The follow-up period was 24 ± 3.75 months (range 18–52 months) [Table 1]. Of the 56 osteosarcoma tissue samples, 80, 89, and 96.5% were positive for HER2 overexpression, p53 protein accumulation, and Ki67 expression, respectively [Table 2]. Disease-free and overall survival was categorized by HER2, p53, and Ki67 expression. HER2 overexpression with P53 were associated with significantly reduced disease-free (<0.01) and overall survival (P = 0.05). Similarly, HER2 overexpression with ki67 were associated with significantly reduced disease-free (P < 0.001) and overall survival (P < 0.04). HER2 overexpression with P53 and ki67 were associated with significantly reduced disease-free (P < 0.02) and overall survival (P < 0.05). 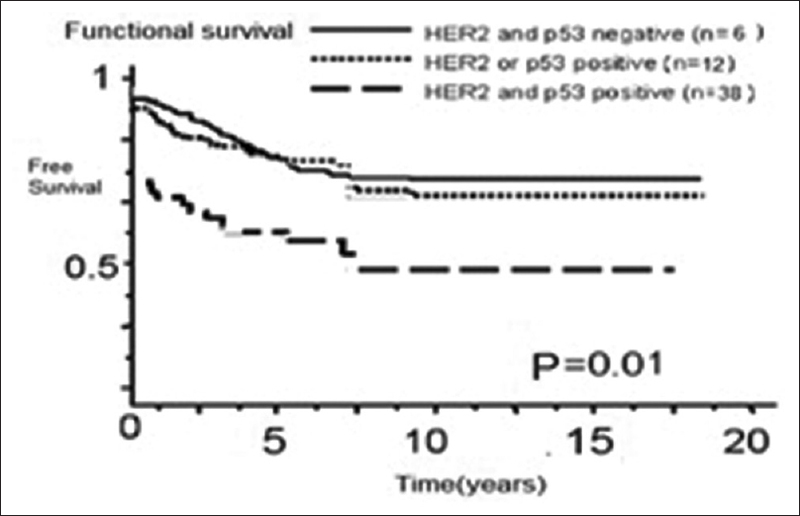 Both the disease-free and overall survival curves were similar between the tumors positive for HER2 overexpression with p53 protein accumulation and Ki67 expression together. The tumors of 38 patients were positive for both HER2 overexpression and p53 protein accumulation. The disease-free and overall survival curves demonstrate that these patients relapsed and died within a significantly shorter period of time after the surgery [Figure 2]a and [Figure 2]b (P < 0.01). The disease-free and overall survival curves for patients with HER2 or p53 positive tumors were different from those for patients with tumors that were negative for both HER2 and p53. 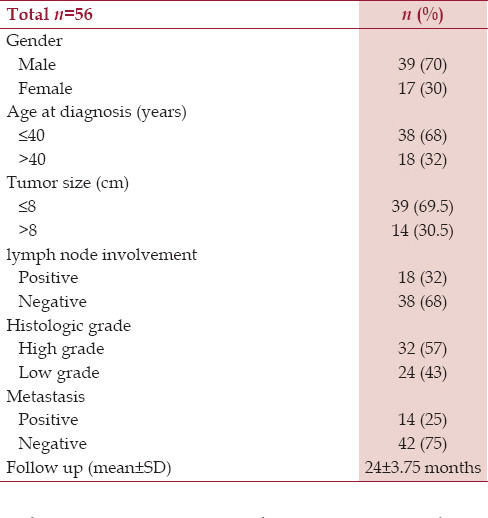 In our analysis [Table 4], combined HER2 and p53 status (P < 0.01) and Ki67 status (P < 0.02), as well as tumor size (P < 0.01), number of positive lymph nodes (P < 0.01), histological grade (P < 0.003) were strongly able to predict disease-free survival. There is no significant correlation between age or gender vs. all parameters. The present study indicates that the coexistence of HER2 overexpression, p53 protein accumulation, and Ki67 expression has strong prognostic significance in osteosarcoma after a median follow-up period of 25 months. HER2/neu and p53 coexpression has been described in numerous human malignancies of the lung, stomach, breast, prostate and other tissues., HER2 encodes a 185-kDa transmembrane glycoprotein with intracellular tyrosine kinase activity that belongs to the HER family. Although no ligand has been identified for HER2, several peptide growth factors bind to the other members of the family. Amplification or overexpression of HER2 is observed in 40% of osteosarcoma. The expression of HER2/neu may be a predictor of chemotherapy response and prognosis in osteosarcoma. For some authors, it is correlated with a poor survival rate. In 1999, it was first suggested that there is correlation of HER2/neu expression with histologic response to preoperative chemotherapy and event-free survival in osteosarcoma. Therefore, HER2/neu was introduced prospectively as a prognostic indicator. Subsequently, over 10 studies have been reported in which the role of amplification/overexpression of HER2 was investigated as a prognostic marker in osteosarcoma. In the present study, we extended our analysis of HER2 overexpression to 38 osteosarcoma, and showed that overexpression of HER2 was associated with poor prognosis. Similar to some other primary human tumors, the mutation of p53 correlates significantly with the presence of high levels of genomic instability in osteosarcomas. The p53 protein is a critical tumor suppressor and central mediator of cellular responses to stress. Inactivating mutations of the p53 gene occur in 50% of all sporadic human cancers.,, The accumulation of p53 protein was significantly associated with poor prognosis in our study as well as in other studies of patients with osteosarcoma. These studies suggest both a prognostic and a predictive role for p53. However, p53-positive staining was not associated with 3-year (RR, 1.64; 95% CI, 0.84 to 3.20; P = 0.15; I2 = 56%) and 5-year survival (RR, 1.25; 95% CI, 0.78 to 2.01; P = 0.36; I2 = 70%). The data from the current study suggest that p53-positive osteosarcoma only predicted a decreased short-term survival rate within the specified period of follow up. Both HER2 overexpression and p53 protein accumulation with Ki67 high expression were not reported. The coexistence of HER2 overexpression, p53 protein accumulation, and Ki67 predict for the development of lymph node involvement and metastases in patients with osteosarcoma, and were significantly associated with a reduced survival within a follow-up period of 24 ± 3.75 months. 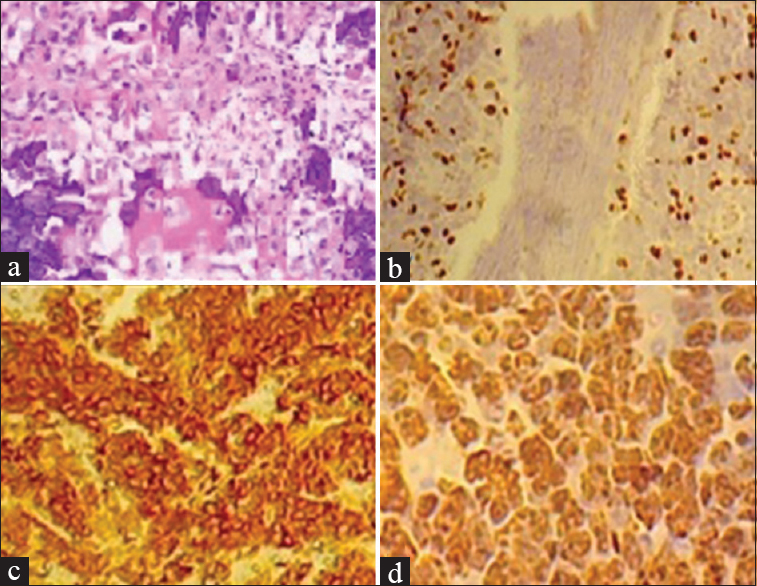 Therefore, the coexistence of these markers is a strong prognostic factor in osteosarcoma. Gurney JG, Swensen AR, Bulterys M. Malignant Bone Tumors. In: Ries LA, Smith MA, Gurney JG, et al., editors. Cancer incidance and survival among children and adolescents: United state SEER Program 1975-1995. Bethesda: National Cancer Institute, SEER Program. NIH Pub. No. 99-4649;1999. Pizzo PA, Williams L, Wilkins. Principles and Practice of Pediatric Oncology. 5th ed. Philadelphia, USA; 2006. p. 1074-115. Bacci G, Briccoli A, Longhi A, Ferrari S, Mercuri M, Faggioli F, et al. Treatment and outcome of recurrent osteosarcoma: Experience at Rizzoli in 235 patients initially treated with neoadjuvant chemotherapy. Acta Oncol 2005;44:748-55. Flint AF, U'Ren L, Legare ME, Withrow SJ, Dernell W, Hanneman WH. Overexpression of the erbB-2 proto-oncogene in canine osteosarcoma cell lines and tumors. Vet Pathol 2004;41:291-6. Gilbertson RJ. ERBB2 in pediatric cancer: Innocent until proven guilty. Oncologist 2005;10:508-17. Ahmed N, Salsman VS, Yvon E, Louis CU, Perlaky L, Wels WS, et al. Immunotherapy for Osteosarcoma: Genetic Modification of T cells Overcomes Low Levels of Tumor Antigen Expression. Mol Ther 2009;17:1779-87. Hughes DP, Thomas DG, Giordano TJ, Baker LH, McDonagh KT. Cell surface expression of epidermal growth factor receptor and Her-2 with nuclear expression of Her-4 in primary osteosarcoma. Cancer Res 2004;64:2047-53. Hughes DP, Thomas DG, Giordano TJ, McDonagh KT, Baker LH. Essential erbB family phosphorylation in osteosarcoma as a target for CI-1033 inhibition. Pediatr Blood Cancer 2006;46:614-23. Morris CD, Gorlick R, Huvos G, Heller G, Meyers PA, Healey JH. Human epidermal growth factor receptor 2 as a prognostic indicator in osteogenic sarcoma. Clin Orthop Relat Res 2001;382:59-65. Fellenberg J, Krauthoff A, Pollandt K, Delling G, Parsch D. Evaluation of the predictive value of Her-2/neu gene expression on osteosarcoma therapy in laser-microdissected paraffin-embedded tissue. Lab Invest 2004;84:113-21. Ferrari S, Bertoni F, Zanella L, Setola E, Bacchini P, Alberghini M, et al. Evaluation of P-glycoprotein, HER-2/ErbB-2, p53, and Bcl-2 in primary tumor and metachronous lung metastases in patients with high-grade osteosarcoma. Cancer 2004;100:1936-42. Zhou H, Randall RL, Brothman AR, Maxwell T, Coffin CM, Goldsby RE. Her-2/neu expression in osteosarcoma increases risk of lung metastasis and can be associated with gene amplification. J Pediatr Hemato Oncol 2003;25:27-32. Olivier M, Hollstein M, Hainaut P. TP53 Mutations in human cancers: Origins, consequences, and clinical use. Cold Spring Harb Perspect Biol 2010;2:a001008. Ozaki T, Nakagawara A. Role of p53 in Cell Death and Human Cancers. Cancers (Basel) 2011;3:994-1013. Overholtzer M, Rao PH, Favis R, Lu XY, Elowitz MB, Barany F, et al. The presence of p53 mutations in human osteosarcomas correlates with high levels of genomic instability. Proc Natl Acad Sci USA 2003;100:11547-52. Geller DS, Gorlick R. Osteosarcoma: A review of diagnosis, management, and treatment strategies. Clin Adv Hematol Oncol 2010;8:705-18. Anne-Marie Capodano, Bone: Osteosarcoma, Atlas Genet Cytogenet Oncol Haematol 2003;7:45-8. Boland JM, Kwon ED, Harrington SM, Wampfler JA, Tang H, Yang P, et al. Tumor B7-H1 and B7-H3 Expression in Squamous Cell Carcinoma of the Lung. Clin Lung Cancer 2013;14:157-63. Zang X, Thompson RH, Al-Ahmadie HA, Serio AM, Reuter VE, Eastham JA. B7-H3 and B7x are highly expressed in human prostate cancer and associated with disease spread and poor outcome. Proc Nat Acad Sci 2007;104:19458-63. Gorlick R, Huvos AG, Heller G, Aledo A, Beardsley GP, Healey JH, et al. Expression of HER2/erbB-2 correlates with survival in osteosarcoma. J Clin Oncol 1999;17:2781-8.